What if – whoosh – right now, the Rapture happened and you got left behind? Or what if it wasn’t the Rapture at all, but something murkier, a burst of mysterious, apparently random disappearances that shattered the world into a single moment, dividing history into Before and After, leaving no one unscathed? How would you rebuild your life in the wake of such a devastating event? This is the question confronting the bewildered citizens of Mapleton, a formerly comfortable suburban community, in The Leftovers . Mapleton lost over a hundred people in the Sudden Departure, and Kevin Garvey, the new mayor, wants to speed up the healing process in order to bring a sense of renewed hope and purpose to his traumatized community. Kevin’s own family has fallen apart in the wake of the disaster: His wife has left to join the Guilty Remnant, a homegrown cult whose members take a vow of silence. His son has dropped out of college to follow a sketchy prophet named Holy Wayne. Only his daughter remains, and she’s definitely not the sweet A-student she used to be. Through the prism of a single family, Perrotta illuminates a familiar America made strange by grief and apocalyptic anxiety. In The Leftovers , Perrotta poses a fascinating question: how would average men and women react if permanently separated from their loved ones? Read by the very talented and wildly acclaimed Dennis Boutsikaris, who was voted one of AudioFile’s Best Voices of 2010, and who, in previous narrations has been called “one of themost mesmerizing audio experiences ever,” (Audiofile, 2011) and “clean, smooth, and compelling,” (Audiofile, 2010), all of Perrotta’s intensity, loss, connection, and meaning are instantly brought to life. The Leftovers is a powerful and deeply moving audiobook about people struggling to hold onto a belief in themselves, and their own futures, allowing listeners to recognize two completely realized selves in its characters: their public faces and their closely held emotional lives. 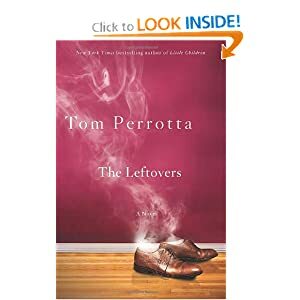 Tom Perrotta is the author of six previous novels including the New York Times bestselling Little Children and The Abstinence Teacher . Little Children and Election were both made into feature films. Joe College and The Abstinence Teacher are under option for films. This was my first experience reading any of this author's novels, and in this go-around I was able to review the book through audio book. The concept of the book was quite unique, millions have disappeared and what are left are those that have to survive and begin again. This book takes place a few years after the disappearances, and as a reader you are brought through the events of the past to come to a realization about the future of this society. The book itself was a fun listen. The actor that read the book, Dennis Boutsikaris was great, engaging and used a tone that kept me intrigued. Outside of his acting though it was the authors words that had me coming back for more. I came to find that the book was strewn with suspense, mystery, and surprise and you are constantly wondering what will come next. The characters in this book were ones that you could relate to, and you find yourself wondering how you too would fare if your loved ones has similarly disappeared without a trace. This was definitely a fun read and one that I would highly recommend!